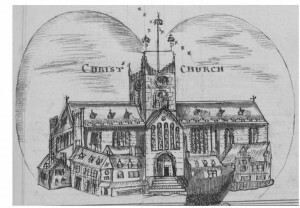 For more than twenty years the Church of Ireland Historical Society (COIHS) has hosted two annual conferences in the fitting surroundings of the eighteenth-century Armagh Robinson Library (spring) and recently refurbished nineteenth-century Music Room in Christ Church Cathedral, Dublin (winter). These provide a well established forum for promoting sound academic standards in the study of Irish church history, and encouraging research. The Society’s constitution can be viewed here. Since its inception the Society has had a strong reputation for attracting renowned international scholars. We are especially proud of our record in supporting postgraduate students working on any aspect of the history of the Church of Ireland, offering them a suitable context in which to present their work (students can send a short abstract by emailing the secretary via the contact link). We also hold an essay competition every year. The W. G. Neely Prize, which is named in honour of the Society’s founder, is open to postgraduate students undertaking a major research thesis with an interest in Church of Ireland history. It is an excellent opportunity to develop their findings. A prize fund of €150 is awarded to the winner. Moreover, her/his essay will be considered for publication in Irish Historical Studies. COIHS warmly welcomes members of the public to attend our conferences for just €10 or £7. Alternatively, you can become a member of the society for an annual subscription of €40 or £35. This will include admission to our biannual conferences, lunch, book discounts, news and information on events of interest, and access to our podcasts. The programmes for the seminars held since November 2007 can be viewed on the Archive page of this website. Rev. Dr Adrian Empey was principal of the Church of Ireland Theological College between 2001 and 2008. He is an established medieval Irish historian, completing his PhD in 1971 on ‘The Butler Lordship in Ireland, 1185-1515’ under the supervision of Professor A.J. Ottway-Ruthven. He has published widely in journals and in books of collected essays, primarily on themes relating to Anglo-Norman settlement and the origins and development of the parochial system. In 2009 he edited: The Proctors’ accounts for the parish church of St Werburgh, Dublin, 1481-1627 (Four Courts Press, Dublin, 2009) and, more recently, he published Gowran, Co. Kilkenny, 1190-1610: custom and conflict in a baronial town (Four Courts Press, Dublin, 2015). He is also on the editorial board of Studies. Dr Robbie Roulston is the strategic projects officer at University College Dublin. He was an Irish Research Council doctoral scholar between 2009 and 2012. His completed his PhD in 2012, entitled: ‘The Church of Ireland and the Irish state, 1950-1972’. He was a lecturer in the School of History and Archives at UCD, teaching a course on: ‘Protestants in a Catholic state? The Protestant experience of independent Ireland’, before undertaking his role as university secretariat in the areas of higher education strategy, governance, and policy. Dr Mark Empey is lecturer in early modern British and Irish history at NUI Galway. He was previously a postdoctoral researcher on the ERC-funded project RECIRC: The Reception and Circulation of Early Modern Women’s Writing, 1550-1700. Between 2012 and 2014 he held the NUI Dr Garret Fitzgerald postdoctoral fellowship at Maynooth University examining the career of the seventeenth-century politician and historian, Sir James Ware (Boydell & Brewer, Woodbridge, forthcoming). He edited Early Stuart Irish Warrants: the Falkland and Wentworth administrations, 1623-1639 (Irish Manuscripts Commission, 2015) and co-edited The Church of Ireland and its Past: history interpretation and identity (Four Courts Press, Dublin, 2017). Professor David Hayton is professor emeritus of early modern Irish and British history at Queen’s University, Belfast. He has published extensively on political and religious history in Britain and Ireland from the Restoration to the middle of the eighteenth century. His most recent works include The Anglo-Irish experience, 1680-1730: religion, identity and patriotism (Boydell & Brewer, Woodbridge, 2012) and, as co-editor, Religion, society and politics in eighteenth- and nineteenth-century Ireland: essays presented to S.J. Connolly (Four Courts Press, Dublin, 2016). Dr Susan Hood is librarian and archivist of the Representative Church Body Library, Dublin. Her interests focus on urban development, estate records as sources for local history research, genealogical research in Ireland. She is author of Royal Roots – Republican Inheritance: the Survival of the Office of Arms (Dublin, 2013) and, as editor, the Register of the parish of Holy Trinity (Christ Church) Cork, 1643-1669 (Dublin, 1999). More recently, she was joint editor of Irish Archives (2016), which is the annual journal of the Irish Society for Archives. Dr Miriam Moffitt teaches church history at St Patrick’s College, Maynooth and is a member of the Centre for the Study of Irish Protestantism at Maynooth University. She is an expert on Irish church missions in the nineteenth and twentieth century and published The Society for Irish Church Missions to the Roman Catholics, 1846-1950 (Manchester University Press, 2010) and Soupers and jumpers: the protestant missions in Connemara, 1848-1937 (Nonsuch Publishing, Dublin, 2008). She also co-edited The Church of Ireland and its Past: history interpretation and identity (Four Courts Press, Dublin, 2017). Dr Jennifer Redmond is lecturer in twentieth-century Irish history in the Department of History at Maynooth University. She is a member of the Royal Irish Academic Historical Studies Committee and formerly president of the Women’s History Association of Ireland. She co-edited Sexual Politics in Modern Ireland (Irish Academic Press, Dublin, 2015) and, more recently wrote Moving Histories: Irish women’s emigration to Britain from independence to republic (Liverpool University Press, 2018). Mr George Woodman worked as librarian in the Northern Ireland Assembly Library for over 30 years. He received an MA in church history at the University of Nottingham in 2018. His thesis was entitled ‘The Blessed Virgin Mary in Seventeenth Century Anglican Theology: A Study in Doctrine and Devotion’. George has previously written on Christian links between Britain and Ireland and Bohemia and Moravia, Nicholas Ferrar and the community of Little Gidding, as well as Bishop Richard Mant. Dr Kenneth Milne is historiographer of the Church of Ireland and keeper of the archives of Christ Church Cathedral, Dublin. His research interests primarily focus on nineteenth- and twentieth-century Irish history. Among his publications are The Dublin Liberties 1600-1850 (Four Courts Press, Dublin 2009) and, as editor, Christ Church Cathedral: A History (Four Courts Press, Dublin, 2010). He recently edited, with Paddy McNally, The Boulter Letters (Four Courts Press, Dublin, 2016). Dr Raymond Refaussé was librarian and archivist of the Representative Church Body Library until 2016. He is series editor of the ‘Text and Calendars’ series with Fourt Courts Press, which aims to publish important archival records from the RCB Library, and is co-editor of the critically acclaimed Directory of Irish archives (5th edition, Four Courts Press, Dublin, 2011). The Very Reverend Dermot Dunne, dean of Christ Church Cathedral, Dublin. The Very Reverend Gregory Dunstan, dean of Saint Patrick’s Cathedral, Armagh.